Seven projects worth more than $145 million are planned to finance storm resiliency efforts. Mayor Bill de Blasio marked the fifth anniversary of superstorm Sandy by announcing the launch of seven projects worth more than $145 million meant to protect the Rockaways from flooding and damage in the face of future storms. De Blasio, speaking at a news conference in Far Rockaway on Sunday, said the city will use $120 million in federal FEMA funds, and an additional $25 million kicked in by the city, the office of Queens Borough President Melinda Katz and “other public and private sources” to finance the storm resiliency projects. “Five years later, it’s impossible to forget what happened, and it’s impossible to let down our guard because we learned this is a fight we’ll be fighting for a long time to make our city safe, to make it resilient,” de Blasio said at the news conference held at the Rockaway YMCA. The seven projects include building new recreational facilities at Bayswater Park and Thursby Basin Park, and the creation of new park areas along Shorefront Parkway and Beach 88th Street. The city will install berms and new bulkheads along the waterfronts of the Edgemere neighborhood and Rockaway Community Park to protect them from further shoreline erosion and flooding, according to a list provided by the mayor’s office. Parks Commissioner Mitchell Silver said the Bayswater Park project will take three years to finish, while the rest of the projects could take four to five years to complete. 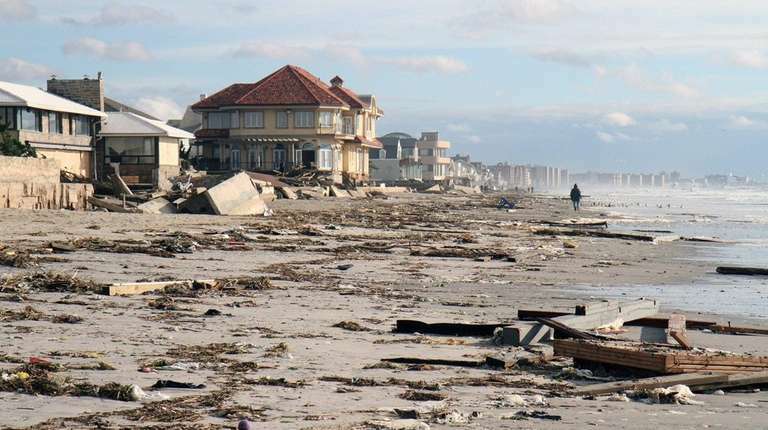 The projects were made public in February, but needed the approval of the Federal Emergency Management Administration, de Blasio said, noting that the $120 million in funding for the projects came from money left over from more than $400 million in federal funds earmarked for restoration of the Rockaway Beach boardwalk that was heavily damaged by Sandy. The federal disaster agency recently signed off on using the leftover money to fund the additional resiliency projects, but must still give final approval to the design of the projects, de Blasio said. The city will hold a series of public meetings on the proposed projects starting in spring 2018, according to the mayor’s office.